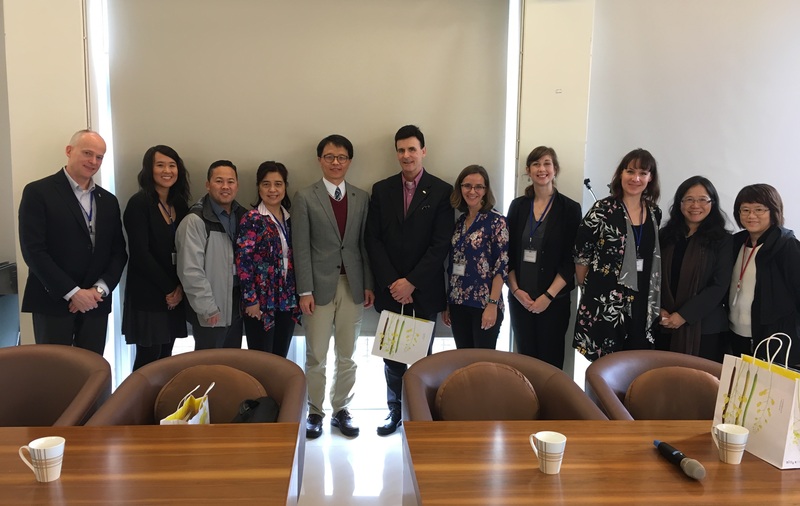 On March 15th, accompanied by Fulbright Taiwan (Foundation for Scholarly Exchange), 8 international education administrators from United States visits NTNU. Prof. Hsiang-Lin Liu, Vice President of Office of International Affairs and Prof. Shew-Jiuan Su, Chair of Geography Department welcomed the guests in person. Every year, Fulbright Taiwan will select international education administrators (the IEA prize) from different institutes in United States to visit overseas universities, in order to attract more American students to study abroad. This time, it is their third time to visit NTNU. These 8 international education administrators are all from different prestigious institutes in United States, which include three partner universities of NTNU: University of South Carolina, University of Texas at Austin, and San Francisco State University. During the courtesy call, Prof. Shew-Jiuan Su first introduced the geographical environment of Taiwan, then Prof. Hsiang-Lin Liu introduced the information about American students studying in NTNU, such as their academic preference, English-taught courses, and scholarships. The guests also raised many questions about the information. Later, the guests visited the Mandarin Teaching Center in NTNU, where they were received by its Executive Director, Prof. Yung-Cheng Shen. Meanwhile, the center also invited three international students who are studying in the center to join the meeting, sharing their experiences of learning Chinese in NTNU, their reasons for coming Taiwan and choosing NTNU. The two sides engaged in profound discussion, the guests had a great time in NTNU.